There is a lot of confusion about the difference between strategy and tactics, and it is important for anybody involved in business planning to be clear about them. Strategy is about the identification of the overall business objective and the route or plan to get there. Tactics are concerned with the steps and actions necessary to carry out the plan. A strategy document should not be a huge tome, in fact it can often be summarised in a single page. However, the tactics employed to achieve that objective may be detailed, complex and extensive. For example, a marketing strategy may be to identify a market gap and secure a (say) 20% share, with a new product in (say) two years. The tactics however, may include research, product development, distribution, partnerships, testing, packaging, advertising, establishing channels, sales promotion etc. Strategies tend to be long term and unchanging except in response to seismic events. Tactics, in contrast, may be constantly evolving and changing in response to market, competitive, environmental forces and practical considerations. Obviously, if you have both strong strategy and tactics (the ‘A’ box) your business is likely to thrive. 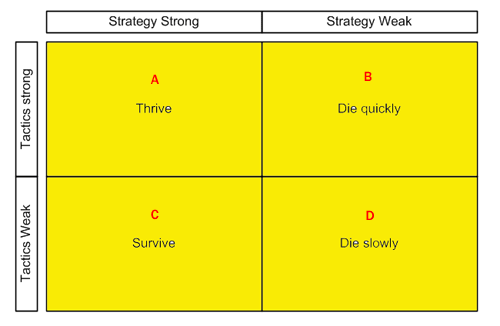 If your strategy is strong but your tactics are weak, you are likely to survive – you are doing the right things, but just not doing them very well (the ‘C’ box). However, if your strategy is weak but your tactics are strong (‘B’), you will probably die quickly – you are doing all the wrong things, but executing them too effectively! If both your strategy and tactics are weak, you are likely to die slowly – you are doing the wrong thing and it may take a while to find out (‘D’).